Our product range includes a wide range of retarding super plasticizer for concrete algisuperplast rm71, retarding super plasticizer concrete and melamine based superplasticizer for concrete. Suggested Dosage 175ml per Bag. Properties: ALGISUPERPLAST--RM71 is an economical naphthalene based super plasticiser with set retardation for M20 to M40 grade of concrete. It is recommended for ready mixed concrete where slump retention of upto 2hrs. is needed. Dosage: 125-300ml per 50 kg bag of cement. Suggested dosage is 175ml per bag. Field trials should be conducted to determine the optimum dosage..
ALGISUPERPLAST -555CA2 is a powerful super plasticizer without much set retardation (at normal dosage range which improves workability without addition of extra water, by dispersing and deflocculating cement particles within the concrete mix. It also allows for reduction in the free water content of the mix by 10-20% when concrete slump is not increased when compared to control. 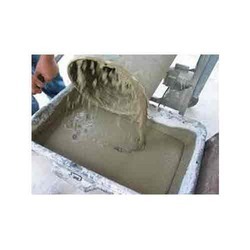 Dosage: ALGISUPERPLAST -555CA2 should be added to the concrete mix at the ratio of 200-600 ml to 50kg of cement. Field trails should be conducted to determine the optimum ratio, for which a dosage of 300 ml to 50 kg of cement is recommended as the initial trail dosage. ALGISUPERPLAST M when used in paver concrete mixes, provides high initial compressive strength within 5 to 7 days. This helps in reducing curing time. It saves cement through economy in mix design. It also increases durability and abrasion resistance of the paver surface, due to reduction in water content at constant workability.